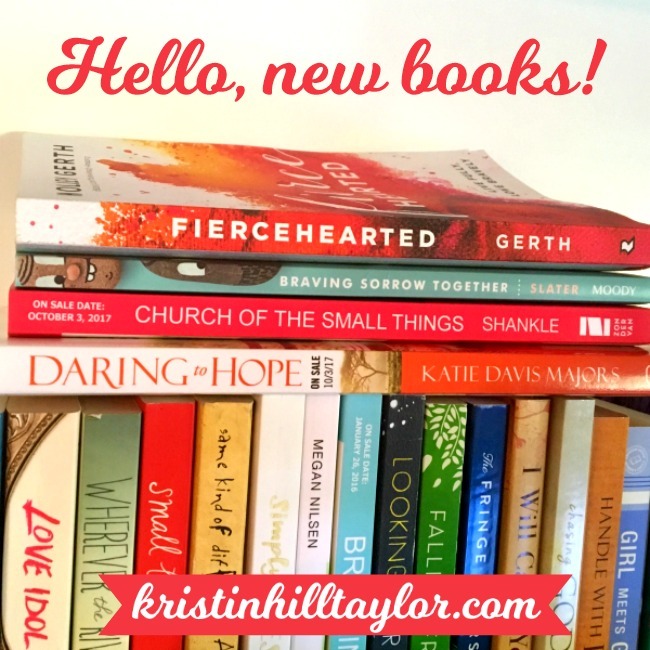 Say hello to so many good books today! I’ve been reading so much goodness this fall. I’ve shared about these books on social media and mentioned some of them here already. But there are so many good ones, I thought you needed a list right here in one place. I’ve really enjoyed the first two of these suspense novels, so I’m eager to read this one! I like the characters and the relationships that are developed while investigating events and stories that keep me wondering that’s next. What I’ve learned from my sorrowful days of when my father-in-law died unexpectedly seven years ago, when Greg and I experienced infertility when we wanted to start a family more than a decade ago, when I walked with my best friend through a hard season in her marriage, and most recently when my grandpa died and we prepare to celebrate his legacy later this week is that we are better together and the joy does come. I recently started reading “Braving Sorrow Together: The Transformative Power of Faith and Community When Life is Hard” and Ashleigh’s words encourage well because we’ve all known sorrow. She also offers stories from others and practical suggestions for grief. This 176-page paperback is published by Moody Publishers. If there’s an author who can make me cry and laugh on the same page, it’s Melanie Shankle. This memoir is made up of stories about the seemingly small things in life that change us from the inside out. She makes “Friday Night Lights” references, tells stories like friends would tell sitting on the porch together, and brings it all back to our faith in the God who weaves all the moments together. This 224-page hardcover is published by Zondervan. Among the stories she shares from her life in Uganda, Katie weaves scripture in with her words so naturally that it’s hard to separate them. She quotes scripture and references the specific verses with endnotes. At first, I wanted to know exactly what she was quoting, but then I couldn’t step away from her stories long enough to flip to the endnotes. That reminded me how we’re called to live out our faith in ways that show others Jesus, not ourselves. I read this book in a day, with my pen in hand so I could mark large sections to read again later. Katie’s stories bring readers closer to God and display a faith well lived. Plus Ann Voskamp writes a beautiful foreword to “Daring to Hope: Finding God’s Goodness in the Broken and the Beautiful.” This 224-page hardcover book is published by Multnomah. This is my favorite book Holley Gerth has authored. I honestly wasn’t expecting that, but she writes this one in a vulnerable way that drew me in to her stories that reminded me of my own stories. Everyone has their own hard parts of life, but Holley’s words in this book spoke right into my life as if she was cheering me on. Through her words, I remembered I can’t control others or their reaction, rested in the truth that loosening my grip isn’t giving up, and was assured as I take some steps to let God make me whole. I want to live in a bolder yet kinder way and “Fiercehearted: Live Fully, Love Bravely” gave me insight into doing so. This 208-page paperback book is published by Revell. This is a wonderful resource for moms and their daughters. With the Bible as its foundation, this devotional prompts conversations about topics that matter. While reading through it with my 10-year-old daughter, I managed to learn some things too. I came away with a better understanding of God, my daughter, and myself. Before we finished “Building Circles of Grace,” Cate and I actually went back and worked through the first devotional in the series, “Becoming a Girl of Grace,” which I also recommend. This fiction read is action packed from the get-go and stays that way all the way through. It’s an enjoyable read with likable characters for whom I found myself hoping found redemption. Plus it takes place in Hawaii, which is never bad scenery to think about. My book is the story of God’s faithfulness through a season of infertility, three adoption processes, and the days since. Through it all, I learned God hears the desires of our hearts, wants us to live in community, and uses all of our circumstances for our good and His glory. This second edition of “Peace in the Process: How Adoption Built My Faith & My Family” is an update of the ebook I self-published in 2014 and is available from Amazon in Kindle and paperback version. It includes contributions from other adoptive moms, my kids’ birth moms, and resources for families who want to grow through adoption and the people who support them. September McCarthy’s words in this book spoke truth into my life right as my family settled back into a new school year, my oldest had a slate of new questions, my boy caught me by surprise again, and my youngest climbed out of her crib. As a home-educating mom of ten kids, this author brought understanding and encouragement to me through her words. I’m obviously not the only mom who has juggled her kids’ various seasons of life. We aren’t to suffer through motherhood. Sure, some days will be harder than others. We will have to make hard decisions, say no when we want to say yes, draw boundaries the kids don’t understand, and walk through heartbreaking circumstances. God promises us peace and joy while we do it. September reminded me of that in “Why Motherhood Matters: An Invitation to Purposeful Parenting,” which is filled with some of her reflections on raising ten kids, truth straight from the pages of the Bible, and practical application to what that may look like in your real life. I want to reread this book and give it to all the moms because we are the mood makers and world changers, right here from our homes. This 256-page paperback was published by Harvest House Publishers on Sept. 1. I received free copies of these books from the authors or publishers to enjoy & review, so that’s what I’ve doing. These opinions are my own, and I wouldn’t recommend anything I didn’t like. And, yes, I decided to include my own book, which I’ve obviously read many, many times.